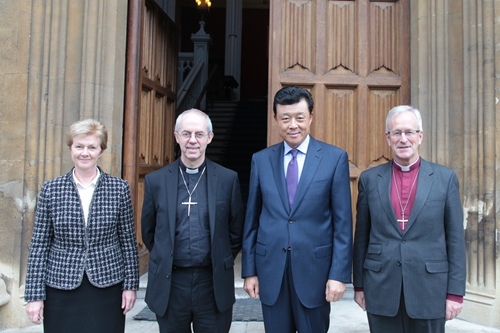 On 13 November, Ambassador Liu Xiaoming visited the Lambeth Palace for a meeting with Justin Welby, Archbishop of Canterbury and leader of the Church of England. He exchanged views with his host on deepening exchanges between Chinese and UK religious communities. David Urquhart, Diplomatic advisor of the Church of England and Bishop of Birmingham, was present at the meeting. The Archbishop said the Church of England has all along adhered to the principles of independence and self-governance, and has actively conducted exchanges and cooperation with the religious groups of countries around the world. In particular, it attaches great importance to and cherishes the traditional friendly relations with China Christian Council and National Committee of Three-Self Patriotic Movement of the Protestant Churches in China. Since his assumption of the post, he has all along regarded it a priority to develop relations with China. As the saying goes, “seeing is believing”. He hoped that he will have the opportunity to witness China’s enormous economic and social changes and the profound impacts on families and religions, and to learn from China’s successful models and experiences in independent development of religions and positive interactions between the government and religious organisations. Ambassador Liu briefed his host on religion in China and China’s religious policies. He pointed out that the recent Fourth Plenary Session of the 18th CPC Central Committee decided on comprehensive advancement of the rule of law. This includes appropriately handling religious and other social issues according to law and promoting the harmonious development of inter-faith relations. Ambassador Liu spoke highly of the exchanges and mutual learning between the Church of England and China Christian Council and National Committee of Three-Self Patriotic Movement of the Protestant Churches in China on the basis of independence, equality and mutual respect. He invited Archbishop Welby to visit China in due course to witness the harmonious coexistence of different religions and ethnic groups and the constant economic and social progress in China.